I am sharing these quotes with you because they really have impacted how I treat learning with my own children. Often we need to be reminded of things and those reminders sometimes come as a breath of fresh air. My heart reads these ideas in Charlotte Mason’s writings and it encourages me to be a better mom and teacher. Currently I am homeschooling my fourth child so that means this is the fourth time I have covered basically the same information in the 8th grade……four times. I could just be going through the motions at this point. Putting my feelings aside, I realize that this is the *first* time this particular son has been in the eighth grade and I need to try to be as up-beat about it as I can. It is all new to him. Today we visited a friend and she has a guinea pig…a really big, hairy guinea pig. My boys have never seen one up close before and they were thrilled. I am not so thrilled with small furry things so I had to put on my “teacher” hat and think of ways to be as thrilled as they are. What is the point I am trying to make? Just that I could have easily been put off by this creature but instead I realized that my boys were excited to see something new so my job was to be encouraging and let them enjoy the experience. 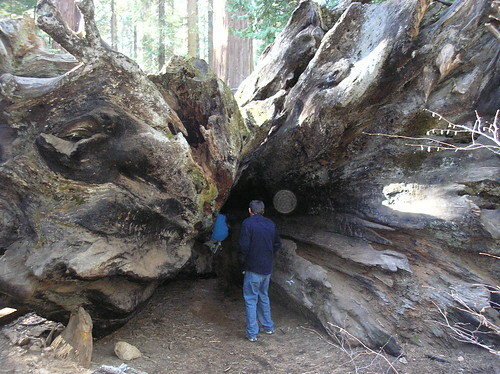 Ever climb through the roots of a fallen giant sequoia tree and out through the hollow center? 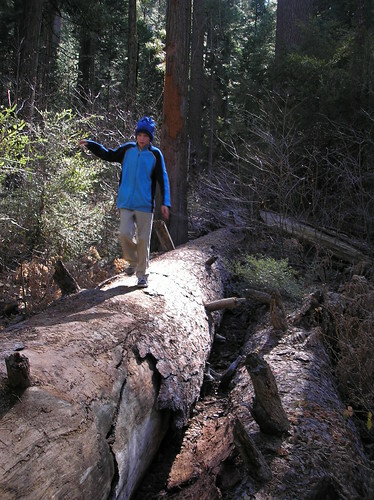 My boys wanted to…so we did. So much of what Charlotte Mason taught was about providing time and space for our children to learn new things….meaningful things from their real life. Our nature study is a window into the world for them and we miss out if we limit what we offer because we are worn-out or tired of looking at the same old things. Yes, a pine cone is just a pine cone to us but to our children it has a color, a shape, a texture, and a fragrance…all new and exciting. Funny thing is that if we allow ourselves to experience these times with our children, we end up enjoying them too. Their enthusiasm rubs off on us and we see things through their eyes….just like it was new to us all over again. It doesn’t matter whether it is looking through a microscope at a leaf, planting a seed in the garden, knitting a scarf, making cookies, or laying down in the grass and looking at the sky. It is the everyday experiences that delight our children and we need to slow down and enjoy it with them. It makes us truly rich.